This item looks to be sold out, but if you had $107, you too could have bought this custom Pikachu Fleece. 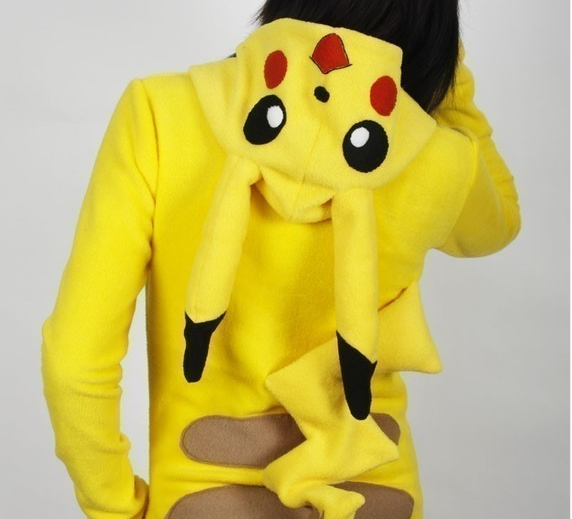 From the bright yellow, to the actually tail that comes on this hoodie, you would look crazy awesome looking like you skinned a Pikachu and climbed inside him. Another cool little gem found on Etsy. For $20 you can look as cool as a Wooper. This hat is handmade out of fleece to keep your head warm in the winter. The creator will alway custom size a bigger or smaller hat for you if you contact them. You can even request for the male or female version of Wooper (based of how the antlers look). That’s attention to detail people. This is a 12” x 16” Blastoise painting on Acrylic. It is to capture a Blastiose being confused after a Psyduck confuses it. I love the dumb look on Blastiose’s face. You can hang this on your wall for only $70. So there you have it. It is to be hoped that you buy our cool shirts before you go shopping for more Pokémon gear. If this article didn’t get your creative juices flowing, it probably just emptied your wallet instead. Thanks for reading, until next Rare Article. Gotta Buy Them All!